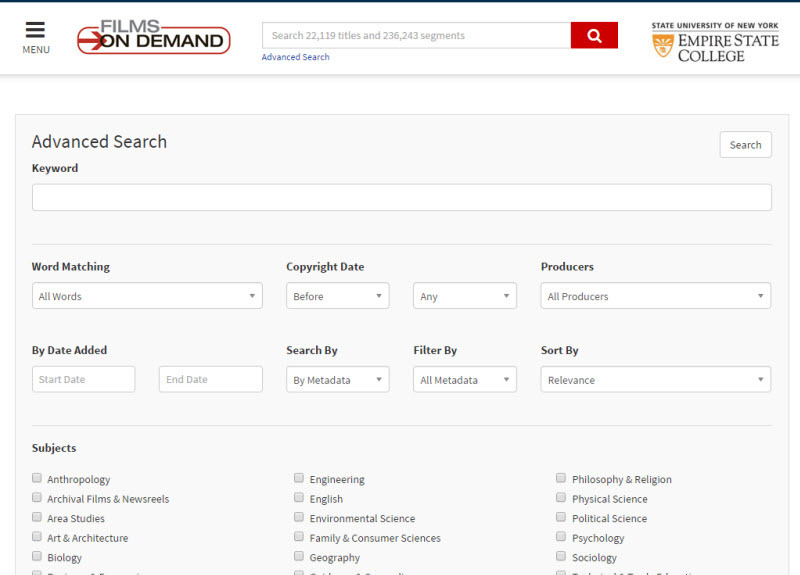 Films On Demand is a database of documentaries, educational videos and news footage. It does not contain movies. Highly desirable items include the works of Bill Moyers and Ken Burns as well as PBS programs, selected TED talks, CNBC political footage, the Biography Channel and films from the American Museum of Natural History. If you know the title of the film or film segment that you are searching for, the search box at the top of the Films On Demand homepage is your best option. 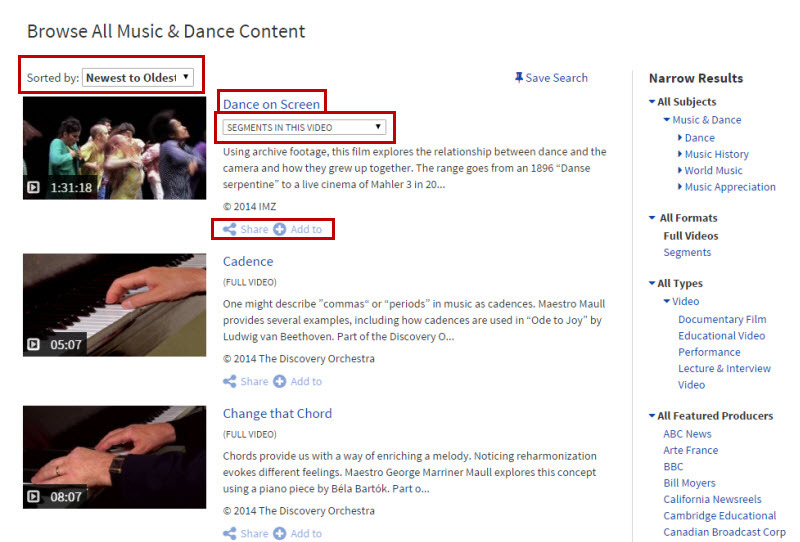 Put the title of the video or section that you're looking for in quotation marks in the search box, OR put the topic you are looking for in the search box. Hit enter or click the red button with the magnifying glass on it. To get to Advanced Search, click the Advanced Search link below the search box. Enter your keywords into the search box. Use the Word Matching pull-down menu to select All Words, Some Words, or Exact Phrase. If you are searching for something like space program or American Recovery and Reinvestment Act, use Exact Phrase. If you do not get any search results using Exact Phrase, try All Words. If you're searching for something like autism applied behavioral analysis ABA or large hadron collider god particle, use All Words. If you don't get any search results using All Words, try Some Words. If you're searching for something like space shuttle Challenger explosion NASA or Ronald Reagan Star Wars missile defense program cold war, use Some Words. If you get too many off-topic search results using Some Words, try All Words. Optionally, select one or more subject areas in which to search. Optionally, limit your search to videos copyrighted in a certain time period. Optionally, limit your search to videos that have closed-captions. Another way to find a video on your topic is to browse by subject area. To get to subject areas go to Browse Subjects, located below the search box. Select View All or scroll through the horizontal picture menu located below the search box. When you click on one of the subject Collections, you get a search results list. The Narrow Results menu on the right side of the search results list lets you drill down to sub-topics. 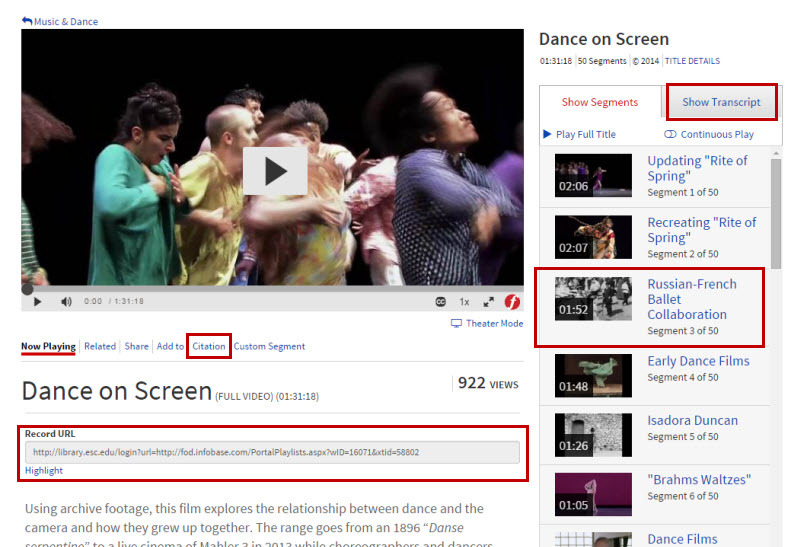 For the Music & Dance collection, some of the sub-topics are Dance, Music History, World Music, and Music Appreciation. 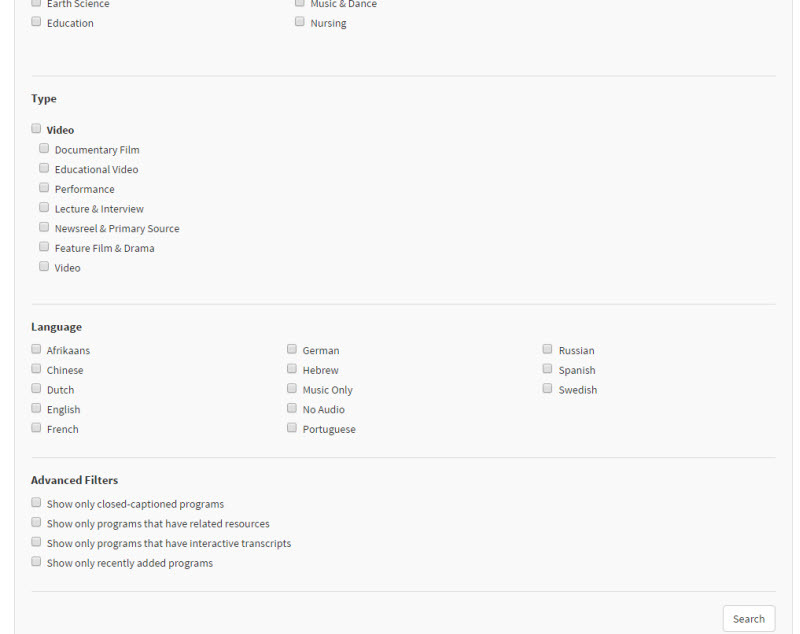 Each of those sub-topics can be clicked on to expand even more specific sub-sub-topics. Click on the thumbnail image of the film to open and begin playing it. 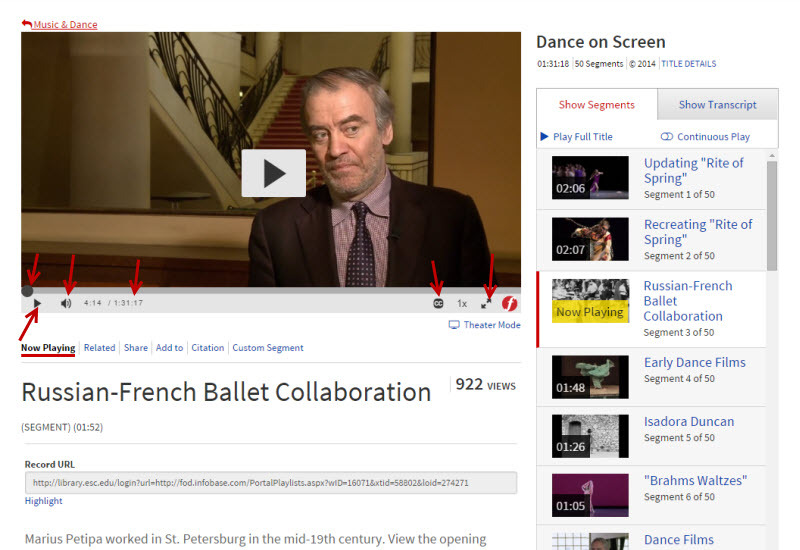 Use the pull-down menu Segments In This Video to see its table of contents. All Films On Demand videos are divided into segments, each of which can be linked to individually. Click Share to email a link to the film. Click on the title of the film to view the film information page. Click on the video to make it start playing. To the right of the video is a menu with tabs at the top. Show Transcript has the full-text of what is being said in the video. The Citation icon underneath the video lets you copy and paste a properly formatted citation of the video in MLA, APA, or Chicago Style. Below the box where the video plays, Record URL is the permalink to the video. Use this if you want to save a link so you can come back to it later, or share it with someone else. In the column to the right of the video, all the video segments are described and listed. Click on the title of a video segment to access it. Each segment has its own unique URL which displays below the box where the segment plays. Don't use the URL from the address bar of your browser! To play a video, click on it. There are controls to pause, move forward and back, turn closed captions on and off, expand the video to fill the whole screen, and adjust the volume. There is also a time code that says how many minutes and seconds into the video you are, and how long the video is in total.